Please don't get mad at us for saying it but we both know it's true... The "back to school" frenzy will be here before you know it. (Groan loudly now!) If you are interested in some personalized products -- some cute bookmarks, notebooks, lunch sacks and more, More Than Paper has you covered with cute things that your kids will proudly sport to class! We love the school themed paper (1) perfect for writing lunch box notes to your little one or communicating with teachers. Choose from a variety of adorable bookmarks (2) for your bookworm. There are great ones for girls and boys! When it comes to personalized paper products, no one has a greater selection than More Than Paper. We have personalized notebooks, personalized agendas and planners (3) that will make organization and note taking a breeze. These very cool personalized school envelopes (4) let parents check off what they are sending in to school. Check "lunch money" when sending in cash for lunch, a "note from home" and other communication essentials. They're something you never thought you needed but make all that paperwork a bit more fun (and so cute that your child won't forget to give it to the teacher)! Your kids will look great on the soccer field, sports field or just in the cafeteria with these personalized water bottles (5). We love how durable they are -- such great quality! Make pencil cases cool again (6) with these personalized ones! And who could forget the lunch bag (7)? We have a wide selection of lunch bags and sacks, perfect for your student. 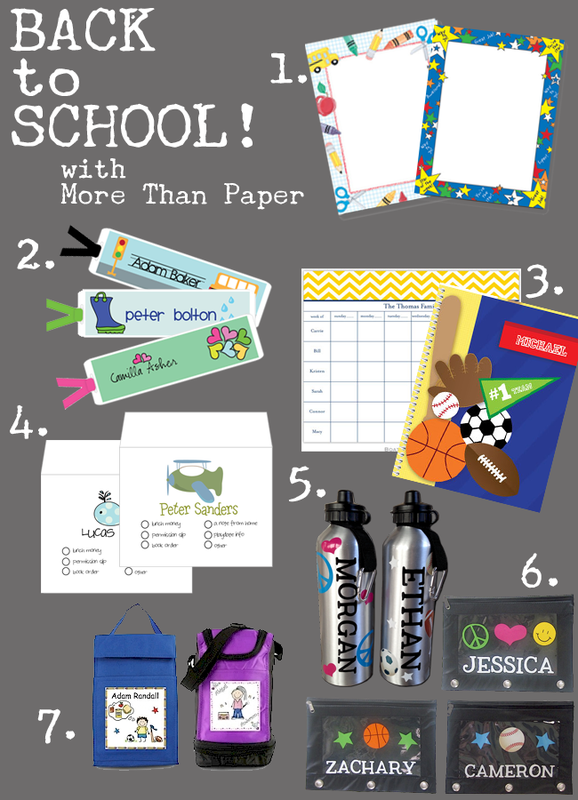 For a selection of plenty more personalized back to school products, check out our website at More Than Paper.